The field is set for the 2018 RBC Cup with games starting this Saturday, May 12 at Prospera Centre in Chilliwack. 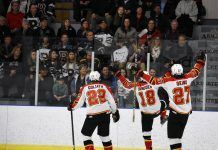 It’s the third time in the last 10 years a BCHL team has hosted the Junior A national championship tournament after Victoria in 2009 and Vernon in 2014. There are 41 players competing in this year’s tournament that are committed to college hockey programs for future seasons, 39 of those to the NCAA Div. I level. 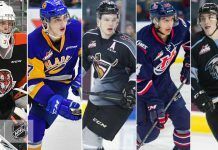 Each of the five teams took a different path to the RBC Cup and there is a look below at how each of them qualified plus their regular season and playoff totals. There is also a few notes on each club on notable players, coaches and draft prospects. The Chiefs made a coaching change May 3, promoting assistant coach and former Chiefs standout Brian Maloney in place of Jason Tatarnic who had been head coach since 2014. The Chiefs have also brought on former Trail Smoke Eaters head coach Cam Keith as an assistant. Keith coached Trail to the Interior Division finals in April. Qualified for RBC Cup by going 4-0 in the four-team Fred Page Cup tournament between the CCHL, LHJQ and MHL plus host. Ottawa beat College Franҁais Longueuil 10-1 in the clinching game. 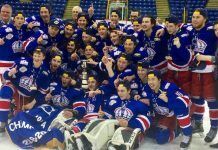 Qualified for the RBC Cup by winning the best-of-seven Anavet Cup. Beat the SJHL’s Nipawin Hawks in six games. Qualified for the RBC Cup by winning the four-team Dudley Hewitt Cup tournament between the SIJHL, NOJHL and OJHL. Wellington beat the SIJHL’s Dryden Ice Dogs 7-4 in the clinching game. Qualified for the RBC Cup by winning the best-of-seven Doyle Cup. Wenatchee beat the AJHL’s Spruce Grove Saints in five games. Wenatchee is the second U.S.-based team to compete for the RBC Cup. The Minnesota Wilderness, then of the SIJHL, competed in the 2013 RBC Cup in Summerside, P.E.I.